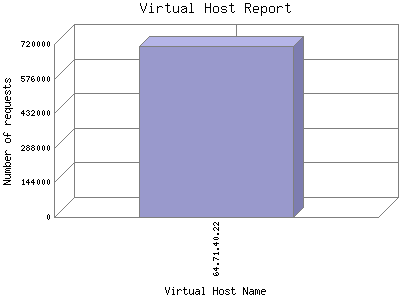 The Virtual Host report provides summary information about the virtual hosts (or sub-host or sub-domain) that are hosted within your site. This is especially useful as an ISP to monitor the usage and traffic on each of the domains you host. This report shows the first 20 results by bytes of traffic. This report is sorted by amount of bytes transferred. Report time frame January 12, 2018 04:08 to January 3, 2019 10:57.